I look forward to filling the window boxes with pansies each spring for the Easter holiday. However, that did not happen this year as my daughter Hannah discovered that a bird had laid a 1” white egg in the flower box outside of her window! 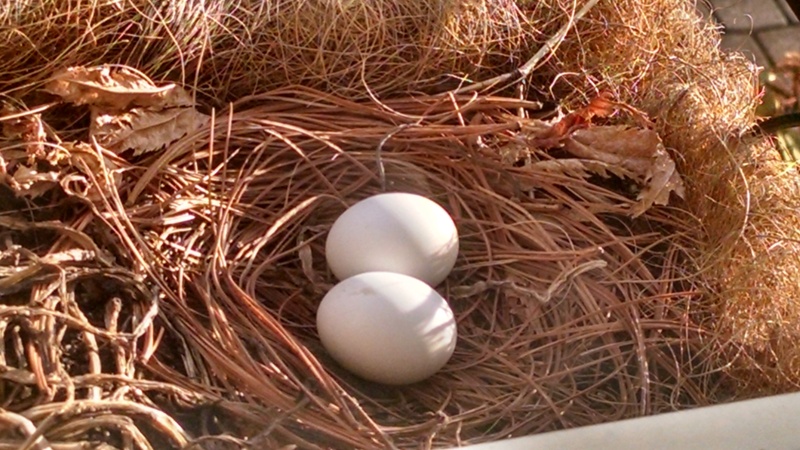 The next day there was another egg in the same nest and then a Mourning Dove took up residency. Since that time the female and male doves have been taking it in turn to sit on the eggs. This is quite admirable as there is no overhead protection and we have had a few very cold and rainy days and nights. Also, she sometimes appeared larger and more fluffed out than at other times and I assumed that this was related to the ambient temperature. A bit of research taught me that the male and female actually take it in turn to sit on the nest, the male during the day and the female at night. So it is more likely that I was looking at two different birds! I found that Mourning Doves raise three or more broods in a single breeding season so it will be interesting to see if they have chosen our window box as a permanent location. Mourning dove nests are usually a flimsy platform nest of twigs located from 5 to 25 feet up in a tree or bush so the current location seems to fit their needs as it is outside a second story window. The nest itself appears to be lined with dried White Pine needles. Each brood consists of two nestlings. One egg is laid in the evening, and the second on the next morning which is what we observed. The incubation period is 14-16 days and it was 16 days after we spied the first egg that I looked out and saw the two nestlings had hatched! They picked a pretty cold and rainy morning to make their appearance. Nestlings, cared for by both parents in the same day/night pattern as incubation, fledge (learn to fly) in about 12-14 days. It seems incredible that they can achieve that so quickly. The parents continue to care for the fledglings until they are 25 to 27 days old. One parent or another is on the nest continually from the time that the eggs are laid until the young are well grown. Mourning doves are found across most of North America. They are smaller and lighter colored than the common city-dwelling Rock pigeon. They are grayish-olive above, lighter underneath, have black spots on their wings and a black cheek spot. Mourning doves have a long, tapered tail that comes to a point. Mourning doves are present in our yard in northern Connecticut all winter, feeding on the ground from seeds that have been dropped by other birds at the feeders. They are actually known to become tamer during the breeding season which can explain why they are not bothered by our presence as we look out of the window at them and marvel at the sight of them.